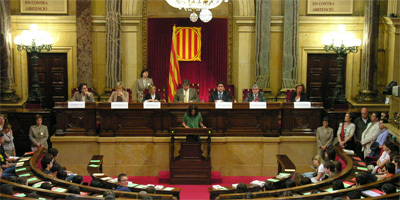 The parties which played a central role in the National Day of Catalonia on September 11, 2012 are now working on a statement on the right of the Catalan people to cut off the tie with the Spanish state. The Popular Party (PP) (18 deputies) and Ciudadanos (3) are against the initiative, while the Socialist Party (PSC, 28) proposes to move towards the construction of a federal state. According to Spanish media, the statement won’t be only a proposition, as others rated in the past by the Catalan room, but goes further, and expresses “the will of Catalan people to vote on the bond with the State of Spain”.